We’ve all heard that exercise makes you happy. 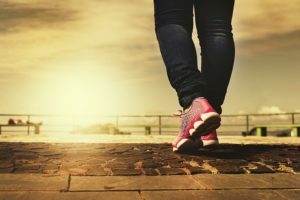 From the well-known runner’s high that keeps runners training for marathon to the little boost in mood many of us have felt after going for a quick walk, it’s no secret that physical exercise does seem to trigger feel-good feelings. But does exercise really make you happy, or is it just a myth? Let’s take a closer look. Research indicates that exercise has numerous benefits, including decreased risk of depression, improved overall health and improved reports of overall happiness. When we engage in physical activity, our bodies release chemicals that boost our sense of well-being and make us feel good. These chemicals also suppress the hormones that cause anxiety and stress. Exercise triggers the release of serotonin, endorphins and dopamine neurotransmitters that are related to pain and depression. At the same time, exercise reduces the activity of hormones like adrenalin and cortisol, which cause feelings of tension and anxiety. The great news is that you do not need to be a marathon runner to experience the benefits of exercise. You do not need to participate in demanding physical activity, either. Going for a walk, doing yoga or participating in low-level strength training all effectively combat stress and anxiety. Of course, the more frequently you get up and move, the better you will feel. Staying active doesn’t have to be difficult. Take the stairs instead of the elevator, or park at the back of a parking lot so you have to walk further to reach the building. Go for a walk on your lunch break. Take your dog out for a walk or enjoy a family bike ride. These simple activities will all help boost your body’s production of feel-good chemicals while reducing your stress and anxiety. Physical activity is an amazing way to improve your health while boosting your overall mood and happiness. Find a type of exercise you enjoy, and stick to it! To learn more or if you need help getting in better shape to start an exercise plan, contact Denver Physical Medicine.